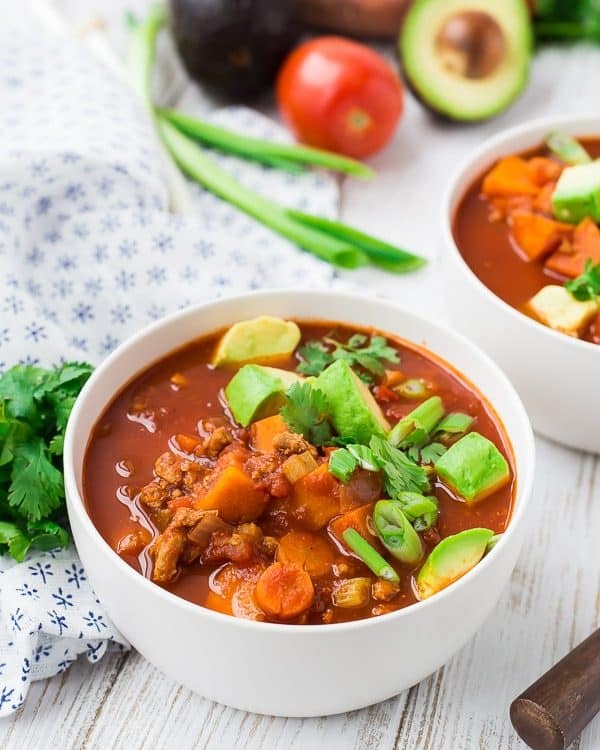 Instant Pot Chili is healthy, adaptable and easy to make. 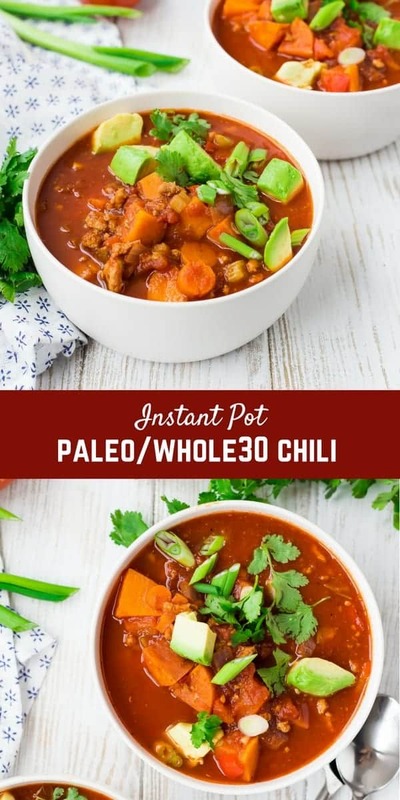 Read all my tips to make it your perfect chili recipe – spicy, mild, vegetarian, Whole30, Paleo, not Paleo, whatever you like, I tell you how to make it happen in this recipe! You can even make it in the slow cooker or on the stove! Can you guys believe how popular Instant Pots and other brands of pressure cookers have gotten? THEY ARE EVERYWHERE. Bloggers are pumping out all the Instant Pot recipes and every day I see a new Instagram story of someone who is making their first pressure cooker recipe. And I’m not mad about it. I adore mine (this is a newer model of the one I have) and use it at least twice a week. Instant Pot boiled eggs have made my life and meal prepping so much easier! Instant Pot sweet potatoes are silky and perfect every time. If I have a package of chicken in my fridge without a recipe destination, you can bet that it’s going to get cozy with salsa verde in my pressure cooker for some juicy shredded chicken. My love affair with the pressure cooker isn’t fading any time soon. I want to know, what’s your favorite Instant Pot recipe? Tell me about it in the comment section! 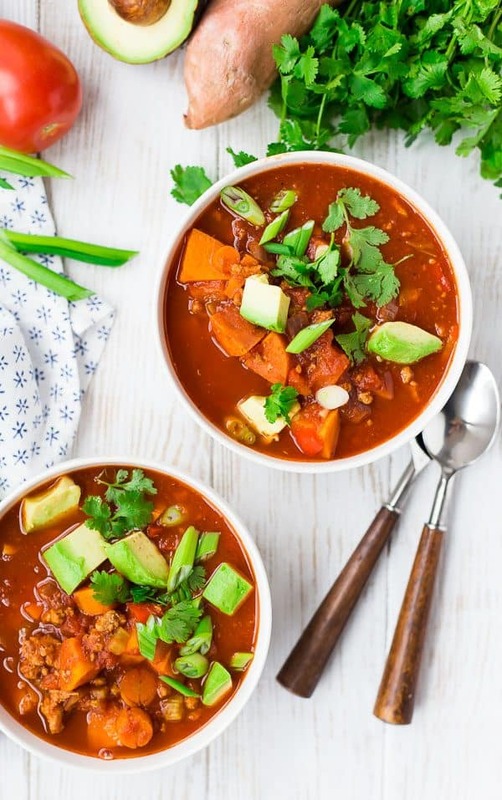 Let’s talk about this chili though – it’s a winner! 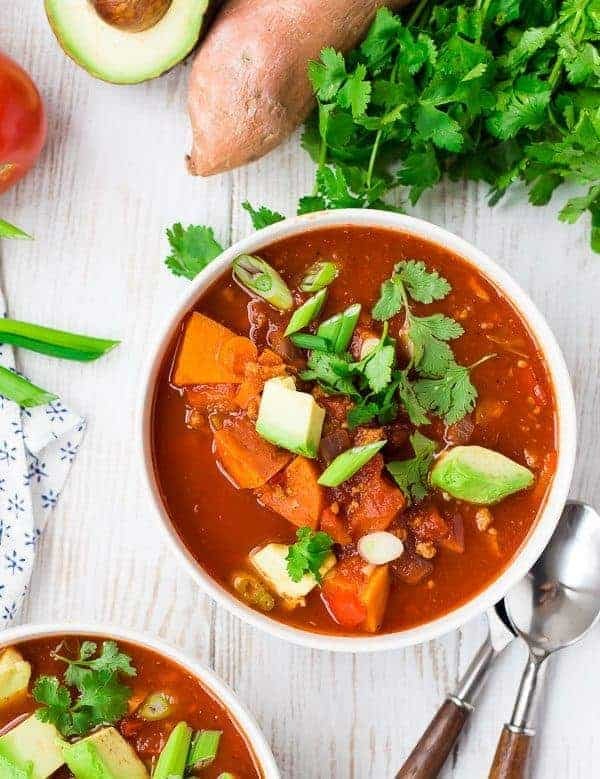 It falls under the Whole30 and Paleo umbrellas, but truthfully it’s a hearty and delicious recipe that you’ll love no matter what type of diet you do or don’t follow. 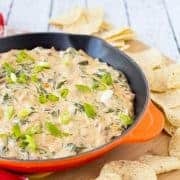 If you’re not doing a Whole30, I’d highly recommend putting a dollop of plain Greek yogurt or sour cream on this and sprinkling it with sharp cheddar. I added carrots, celery, and sweet potatoes to the normal roster of peppers, onions, and tomatoes to amp up the vegetable content and alsop make this nice and filling even though it doesn’t contain beans. If you’re following a specific diet and prefer beans in your chili, I have good news for you – add them in! I love pinto and kidney beans in chili. I’d put in one or two standard size cans (drained and rinsed). You might need to add a bit more liquid (broth or water). Vegetarian? Omit the ground meat and try this with chickpeas, lentils, quinoa, or a combination of all three. Don’t like things super spicy? Leave out the cayenne. Don’t love smoked paprika? I didn’t at first either, but it’s grown on me in a big way. You can leave it out for a more traditional, less smoky, tasting chili. Don’t want the sweet potatoes in there? Okay, leave them out! Like ground beef better than ground turkey? No problem, use it! If it has a higher fat content, you might need to drain out the fat after browning it. Want to make it in the slow cooker or on the stove? Cool! Read the recipe notes for details on those cooking methods. Heat Instant Pot to sauté and brown the meat with a bit of oil. Add onions, peppers, celery, and carrots (these can all be prepped a day in advance and kept in a zip-top bag in your fridge). Add spices (If you want to do more of the prep a day in advance, measure these all into a bowl and cover with plastic wrap). Add tomato paste and then the rest of the ingredients (canned tomatoes, broth, sweet potatoes). You could also dice the sweet potato in advance and keep submerged in water in your fridge. Pressure cook for 12 minutes on the high setting, quick release, add ALL THE TOPPINGS and enjoy! 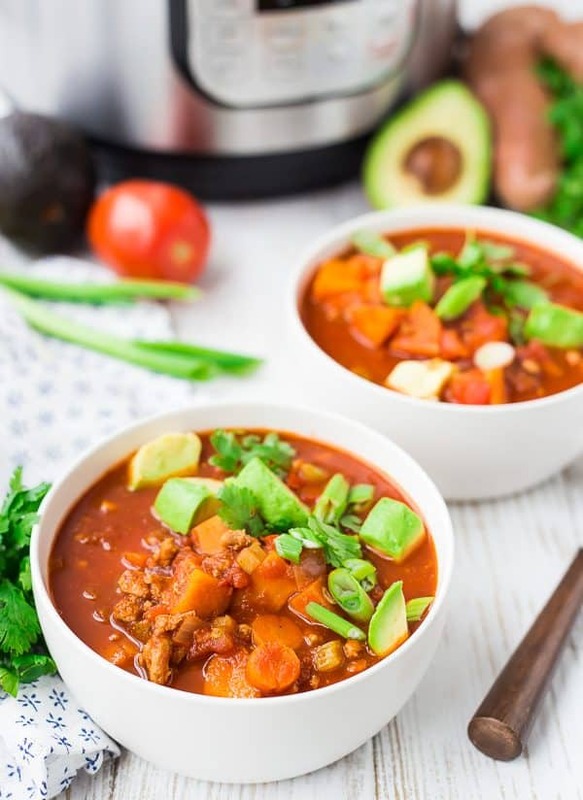 This Instant Pot chili is not a time consuming recipe at all (one of the benefits of the Instant Pot! ), you could easily do all the prep as you’re making it, but sometimes it’s nice just to get a little more ahead of the game! If you have some experience in the kitchen, you can chop the vegetables while the meat is browning, and measure out the spices, chop the sweet potato, and open your cans while the vegetables sauté. If you do that, you can have this recipe on the table in about 30 minutes. 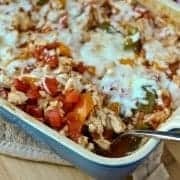 Easy Chicken Chili Recipe – 5 ingredients! 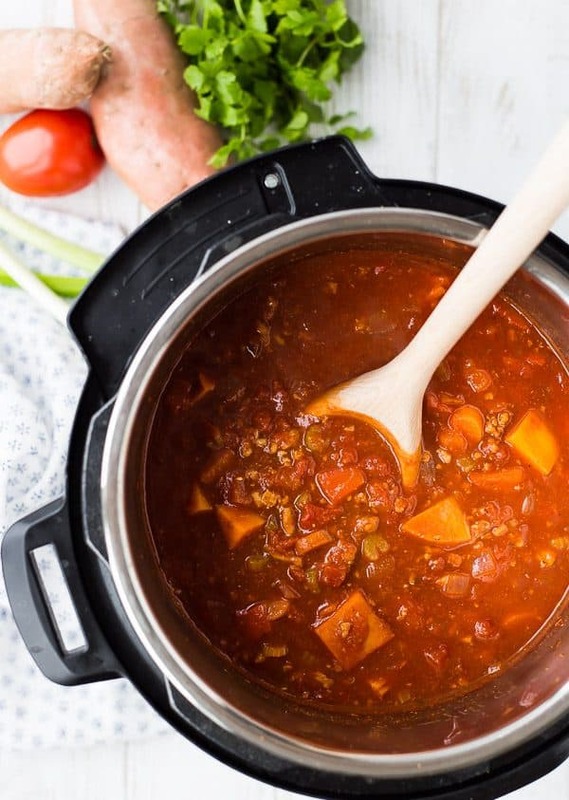 If you love this Instant Pot Chili, you’re going to adore my Instant Pot Chicken Noodle Soup. Turn pressure cooker on to Sauté and add oil to insert of Instant Pot. Add ground turkey, season with salt and pepper, and brown, breaking up as it cooks – about 6 minutes. When it is no longer pink, add onion, bell pepper, carrots, and celery. Continue to sauté until onions start to become translucent – about 3 minutes. Add spices (chili powder, cumin, smoked paprika, oregano, garlic powder, and cayenne). Stir to coat and to gently toast spices. Add tomato paste and stir, breaking up tomato paste and continuing to cook until everything is coated with tomato paste, being careful not to let it burn. Add sweet potato, crushed tomatoes, diced tomatoes, and broth. Stir to combine, scraping up any brown bits on the bottom of the pot. Secure cover on Instant Pot and turn valve to seal. Cook on high pressure for 12 minutes. After 12 minutes, quick release the pressure by turning the value to vent. Once it is done releasing pressure, remove cover and enjoy topped with your favorite chili toppings. Ground beef may also be used. If you use a ground meat with a higher fat content, you may have to drain it after browning. To cook in the slow cooker: Sauté the meat and vegetables on the stovetop in large skillet. Add the spices and tomato paste and stir to combine. 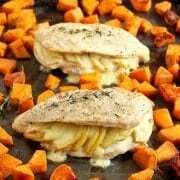 Place this mixture along with the rest of the ingredients in the slow cooker and cook on low for 6 hours or on high for 3 hours or until the sweet potatoes are fork-tender. To cook on the stovetop: In a large pot, sauté the meat and vegetables in the oil. Add the spices and tomato paste and stir until combined. Add the rest of the ingredients and bring to a boil. Reduce to a simmer and simmer uncovered for 30-45 minutes or until the sweet potatoes are fork-tender. I like red bell peppers but any color will work! If you’re following a Whole30 diet, make sure to choose compliant broth. Many contain sugar or honey. If you’re in a pinch, you may also use water – it still tastes great that way! Verdict: I love this Instant Pot chili. The smoked paprika adds such a nice smoky flavor and the sweet potatoes are such a nice surprise. Husband’s take: Ben liked this a lot but he asked for less cayenne next time. I thought the spice level was fine, but the great thing about this recipe is that it will still taste fantastic, even if you leave the cayenne out completely. Changes I would make: None are necessary, but if you want to make this your own, check out my ideas I shared above, or read the recipe notes. This looks like perfect comfort food! Plus, it’s an instant pot recipe, so perfect! This is perfect for gameday! 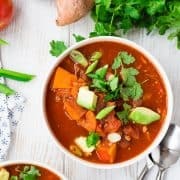 I love chili, and I also love the fact Whole30 is involved! Thank you for sharing! I still haven’t bought an instant pot.